Quinn tells Sheila that she&apos;s Mrs. Forrester and always will be. Sheila wants Eric to tell her he knows about her affair with Mateo. Mateo comes into the room. He confesses he was offered money to seduce Quinn. Wyatt tells Katie that Quinn will learn to live with their relationship. He says that Quinn has another enemy to deal with. Katie thought Sheila left town, but Wyatt tells her she&apos;s there to sabotage Quinn&apos;s marriage. The talk heats them up, so they go upstairs. Eric tells Sheila he had to get through to her. He says he&apos;s in love with Quinn and won&apos;t leave her despite her attempts to break them up. He doesn&apos;t believe Sheila&apos;s changed. He tells her to leave their house and get out of his life. Mateo apologizes to them, saying he thought he was looking out for Eric based on Sheila&apos;s intel. 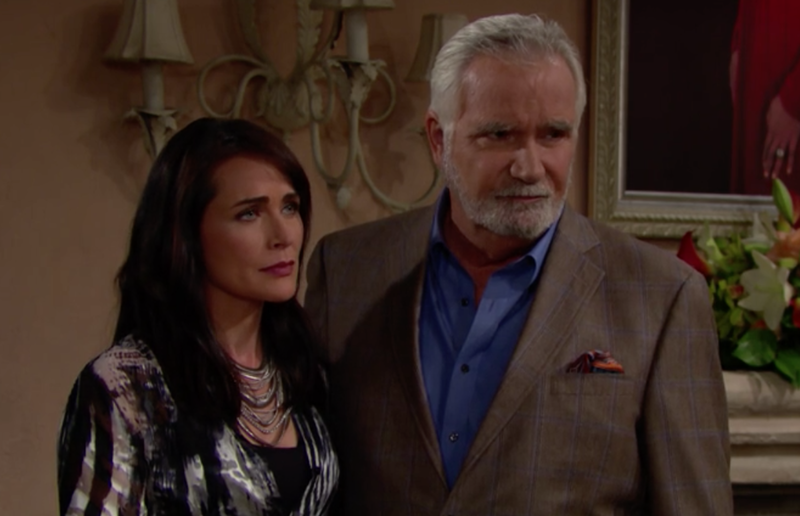 Sheila asks Eric not to give up on her. She claims she only had his best interest at heart and that she&apos;s working on herself. Quinn tells her to leave and never come back. Later, Wyatt tells Katie he doesn&apos;t know what will happen with his job. Bill calls a meeting, but he gets distracted by Katie&apos;s midday lingerie. Katie invites him back after his meeting. Sheila asks for time alone with Eric. He allows it. Sheila tells him Quinn passed her test. She admits Quinn&apos;s a better woman than her. She apologizes and tells Eric he means the world to her. She came to LA to get forgiveness. Eric tells her to let go of her dream. He believes she won&apos;t find what she&apos;s looking for in LA. She tells him she will miss him and walks out. Once she&apos;s outside, Quinn approaches and startles her. She tells Sheila to get the hell off her property. She calls Sheila sick and demented. She warns her she will never be a Forrester again. Quinn tells her goodbye forever and walks into the house. Sheila turns around with her familiar evil look and laughs. Clearly, she&apos;s not done with the current Mrs. Forrester. I&apos;m at a conference out of town. I&apos;ll do my best to get a recap done for Friday&apos;s episode.